T-Amtech Engineering Sdn Bhd - Metal Engineering Works, Heavy Duty Material Racking Johor, Malaysia. 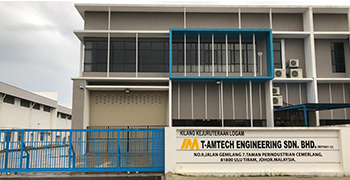 We are pleased to present T-Amtech Engineering Sdn Bhd (formerly known as Amtech Engineering Work) company profile and services provided for your perusal. We welcome the opportunity to work with you, supporting your strategic business objectives and continuously adding value to the organization. T-Amtech has been established for 9 years since year 1999 and the principal of the company were specialise in all kinds of Metal Engineering Works, Gutter, Platform, Awning Plumbing & Repair Service, Cooling Tower & Air Piping, Partition Renovation Work & etc. In Feb 2008, Amtech Engineering Works name was officially changed to T-Amtech Engineering Sdn Bhd to be inline with our company business & direction in providing total facility management services. pages. We look forward to becoming your long-term strategic business partner. To build T-Amtech Engineering Sdn.Bhd. Into a leading company admired,integrity and creative leadership rooted in good human values. To achieve high quality and provide our best service item of design,work supervision,work complete within time frame,technical innovation in our scope of work and customers satisfaction.